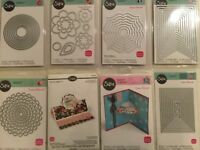 Details about Sizzix 3 Dies PARTY SET #656326 NEW! FREE SHIP & GIFT! Sizzix 3 Dies PARTY SET #656326 NEW! FREE SHIP & GIFT! Payment must be received within 3 days unless arranged differently with Seller. Returns are only accepted if merchandise is defective or not as described. Please email questions before purchasing. Thank you.